I’m currently reading The London Book of Days by Peter de Loriol. For my TT this week, I thought I’d give you a quick rundown of some of the things that happened this week in London history. 1. Nov 24 1434 – There was a severe frost. The cold snap continued until Feb 1435 and the river Thames froze over. Frost fair alert! 2. Nov 24 1740 – A man called William Duell was hanged at Tyburn. His body was prepared for dissection by surgeons, but they found he was still breathing! They ended up deporting him instead. 3. Nov 25 1944 – World War two is in full swing. By this date 251 V2 bombs had been dropped on London. The first V2 bomb was dropped on 8 Sep 1944. 4. Nov 25 1952 – A murder mystery play called The Mousetrap, written by Agatha Christie, opened at the New Ambassadors Theatre. This show is still running in London at St Martin’s Theatre. I’ve seen the show twice and loved it both times. 5. Nov 26 1703 – A hurricane struck London. It ripped off roofs, destroyed spires and turrets and forced ships from their moorings. 6. Nov 26 1962 – The Beatles recorded their single Please Please Me at the Abbey Road Studios. 8. Nov 26 1983 – Gold bars worth 26 million pounds were stolen from Brink’s-Mat security warehouse at Heathrow Airport. The resulting investigation took almost 10 years and most of the gold was never found. 9. Nov 29 1814 – The Times newspaper was printed by steam instead of manual power. The steam printing press could print 1100 sheets an hour. 10. Nov 29 1855 – A public meeting was held at Willis’s Rooms to raise funds for what became the Nightingale School of Nursing. 11. Nov 29 1934 – Prince George, Duke of Kent married Princess Marina of Greece at Westminster Abbey. 12. Nov 30 1016 – King Edmund II of England was reputedly stabbed in the bowels whilst in the outhouse. He died on the same day. 13. Nov 30 1936 – A small fire at Crystal Palace, Sydenham raged out of control and destroyed the entire building. 88 fire engines were deployed to fight the fire. Melted glass was everywhere. The London Book of Days is a really interesting book full of snippets about London history. If you enjoy history, you’ll love flicking through this book. 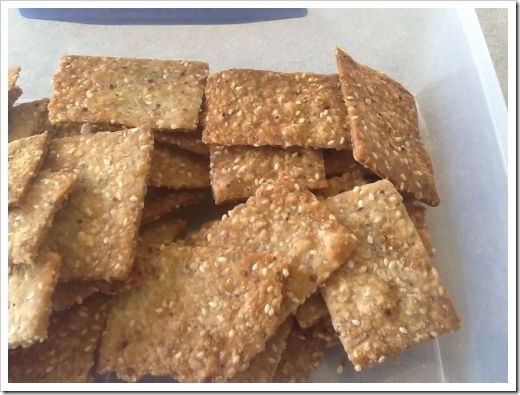 I’ve been looking for a cracker recipe for ages – something to eat with cheese or to serve with a dip. This is one of Annabel Langbein’s recipes. I’ve made it several times now and the end result is always good. These are moreish! They’re also very easy to make. 1. Preheat the oven to 165 C.
2. Place dry ingredients, seeds and herbs into a bowl. 3. Mix the oils and water together and add to dry ingredients. Mix to a dough. 4. Split dough into four and roll out each part as thin as possible. 5. Cut into strips and each strip into a cracker size. 6. Bake on a baking paper-covered tray until crisp and golden – about 15 – 18 minutes. 7. Cool and store in an airtight container. 1. 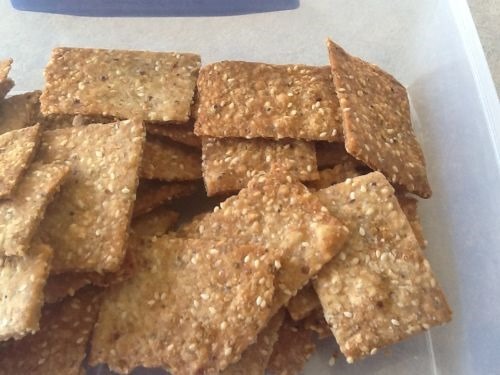 I didn’t have any sesame oil and used all olive oil in my crackers. 2. I’ve substituted other herbs such as rosemary and other spices such as cumin seeds. Ms Langbein suggests chili or parmesan. 3. Hubby made this recipe and rolled the dough through the pasta machine to make it extra thin. I use the rolling pin. 1. 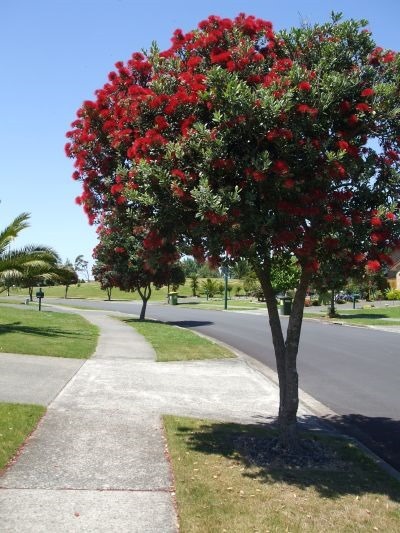 Some of our native pohutukawa trees have burst into flower. The trees growing near the sea have started to flower and the others closer to our home should start flowering soon. 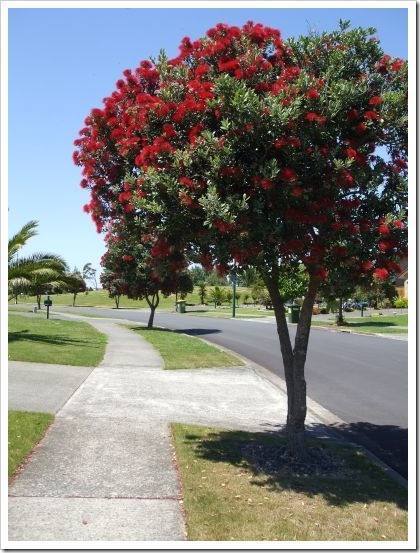 The pohutukawa tree is known as New Zealand’s Christmas tree. 2. Daylight saving has kicked in and our days are longer. We’re starting to take the puppy for a walk after dinner. 3. All the local malls have put up their Christmas decorations. 4. I heard Snoopy’s Christmas (one of my fave Christmas songs) for the first time today. 5. I received an email from one of my favorite cafes telling me I’ll receive a free muffin since it’s my birthday. My birthday is at the beginning of December and slap-dab in summer. 6. Some days it’s hot enough to wear shorts. Now all I have to do is make sure my legs are silky smooth! 6. The strawberries are ready to pick. Yum! What is the first sign of summer for you? And if you’re in the Northern hemisphere – what is the first sign of winter for you?